At their worst, honey bees are known for delivering painful stings, ripping apart their own tiny bodies in the process, just to protect their own hive. At their best, however, honey bees are much more impressive — not to mention, way less gruesome. According to the Animal and Plant Health Inspection Service of the United States Department of Agriculture, honey bees’ pollination is responsible for over $15 billion in added crop value, particularly for specialty crops such as nuts, berries, fruits and vegetables. With 2.5 million colonies in the United States, nearly every American citizen should be thankful for honey bees and their keepers. “Growers depend increasingly on beekeepers from other states to transport honey bee colonies across the county to meet the pollination demand (a practice known as migratory beekeeping),” the USDA’s website reads. But human behavior also puts the insects in danger. According to the website for the Natural Resources Defense Council, pesticides, the loss of habitat and climate change are all factors that have contributed to the loss of honey bees. Some disease has, too. Pathogens carried by mites, often known as varroa destructors are known to weaken bees. Locally, a pest known as the small hive beetle affects bees in many parts of the country. Two area businessmen, however, are working to change that. Richardson tells the audience the beetles were first found in 1996 in Charleston, South Carolina, where they were most likely imported on a loaded fruit from South Africa. He moves on to explain his company’s idea: a transparent, red piece of acrylic shaped like a lid. It fits over a honey bee box hive, known professionally as a Langstroth hive, which almost looks like a small set of drawers. As sunlight shines through the acrylic, it creates red light inside the hive that disturbs small hive beetles and deters them away. He calls the product the Beetle Banisher. Later, at local beekeeper John Raleigh’s residence, Richardson and business partner Joseph Bennett explain how their idea was discovered. 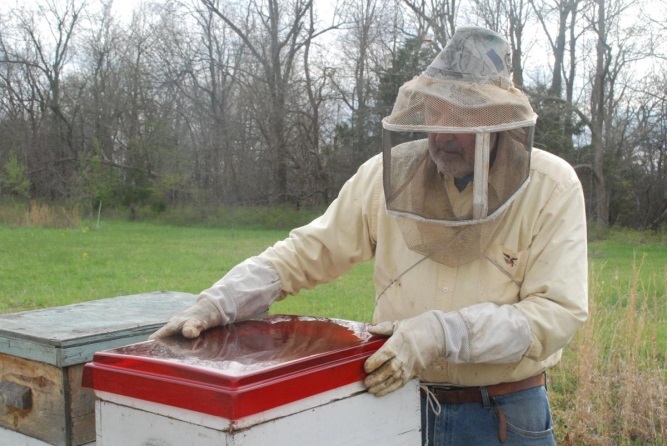 After using a white light to build and repair honey bee hives at night, the partners went home covered in stings. Later, Bennett and Richardson learned through another beekeeping friend that while white light is troublesome to bees, red light doesn’t bother them. The discovery led them back to the small hive beetle — a pest they were growing tired of dealing with, Bennett says. They wanted to test whether the parasite had an aversion the red light. Once prototypes for Bennett and Richardson’s product came in, several were sent to beekeepers in Florida, where small hive beetles are a year-round concern. One prototype went to Raleigh, too. Of course, there are similar tools in the beekeeping world that protect bees from the pests, but Richardson and Bennett say they have yet to find a product that works as well. “Beetle Banishers are the safest, easiest, most effective way to eliminate the threat (of) Small Hive Beetles,” the product’s description reads on its website. The product is currently available for order online, but Richardson says the pricing is hefty. “They’re expensive, because I’m having to have them made in the United States,” Richardson says, noting the price at $65. They soon hope to find commercial beekeepers interested in placing a significant order, so the company can work with China, where Beetle Banishers can be manufactured for a cheaper price. All in all, however, the pair just want to protect as many bees from beetles as possible. Richardson says the truth lies in the numbers. He says the beetles are just as responsible for killing bees as any other factor. The three want people to know the seriousness of the situation.